Mammalian and insect cells are especially fragile and susceptible to shear forces. 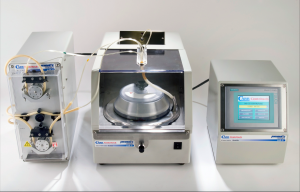 The Centritech LAB III System provides a low-shear technology to improve the yield in perfusion, harvesting or other cell processing applications. Unlike filtration systems which inherently clog or foul, Centritech LAB III System provide reproducible, steady state operation. Separation system Centritech Lab III is a flow centrifuge for working with mammalian and insect cells. It is designed to concentrate cells and clarify the culture medium in the processes of cell harvesting, in perfusion systems, and for the separation of viable cells from dead cells and cellular detritus. Centritech Lab III uses a soft separation mechanism. 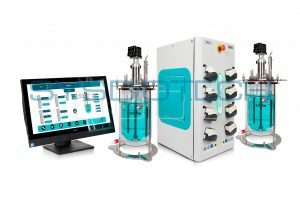 The fluid from the bioreactor is fed to the Centritech Lab III system using a peristaltic pump, which gently separates viable cells, dead cells, cellular detritus and clarified liquid. 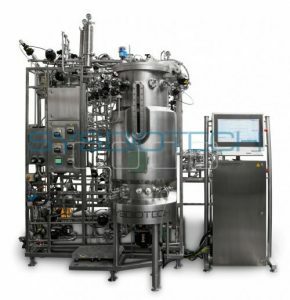 In a perfusion system, viable cells can then be collected or automatically returned to the bioreactor, resulting in increased biomass density and product yield. The separation process takes place in a previously sterilized disposable container, called the separation insert. The separation insert is the only part of the system that comes into contact with the cell culture. Thus, a closed system reduces the risk of contamination of culture and the leakage of potentially harmful products. 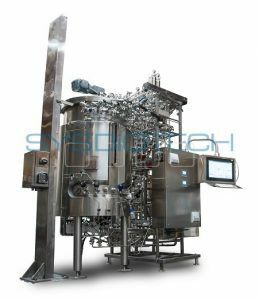 By using a three-stage separation, isolation and discharge process, the Centritech Lab III separation control system controls the rate of sedimentation of cells, as well as the flow and direction of fluid flows at the inlet and outlet of the separation insert. The air barrier separates the cellular material from the supernatant, preventing the dilution of the cell mass during the unloading process. Separation takes place in a presterilized insert. Process contact surfaces are constructed from USP Class VI pharmaceutical grade materials. 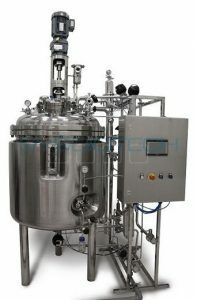 Once the insert is installed and tubing connected using aseptic technique or sterile welding, the system is closed, offering a high degree of aseptic reliability without the need for CIP or SIP. In the LAB III System, the cell suspension is fed into an inlet at the top of one end of the insert and the cells are centrifugally separated from the media. 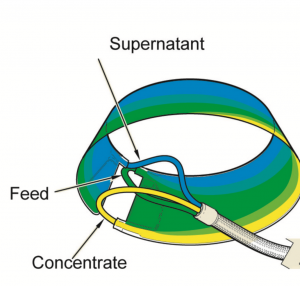 Clarified supernatant exists from an outlet at the top of the other end and cell concentrate is discharged from an outlet at the bottom of the insert. The Centritech LAB III Systems offer flexibility for your application. Control over both pumps (time and flow rate for feed and discharge) as well as centrifugal forces assure for your specific cell line application. Process developed at the research or pilot scale on the LAB III system are convertible to the Centritech CELL System, the larger oor model, making scale-up from the pilot to full production very easy.